Red Belly Piranhas (Pygocentrus nattereri) is one of the most wide spread species of Piranha in nature and the most common in pet stores. When someone hears the word "Piranha" this is the fish that comes to mind. 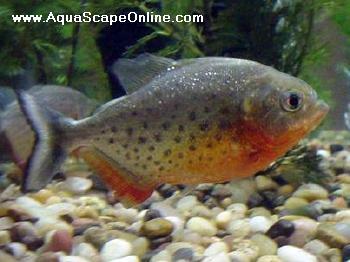 Red Belly Piranha (Pygocentrus nattereri) are found in abundance in the rivers of central and southern South America east of the Andes and including the coastal rivers of the Guyana's, Surinam and Brazil. In the northeast region of Brazil, there have been introductions into the small human-made lakes common there. Captive Red Belly Piranha can be taught to eat almost everything meaty, ranging from feeders (goldfish, rosy reds, minnows, tetras, basically anything small enough), frozen fish (smelt, cod, catfish, salmon, tuna fish etc. ), shrimps, krill, mussels, squid, insects and even small mammals (pinkies, mice....), reptiles and amphibians. Some owners have 'learned' their piranha's to eat food items such as dog- and catfood, cheese, fish flakes and pellets, and even seeds vegetables (such as cucumber), and fruit. Other make their own food cubes by blending different ingredients, ranging from pellets and food supplements designed for aquarium fish, to vegetables and meat, mix it with gelatine, and freeze it. Red belly Piranha, like other Pygocentrus-species, catch living prey by active chase. Red Belly Piranha will chase a group of fish, snapping at anything they can get a hold of and will chase individual prey until caught. This can take quite some time, because they are fast swimmers, but can sustain high speeds for only short bursts. Red Belly Piranhas will also practice the ambush method, but usually only get a fin or mouth full of scales rather than the whole fish. 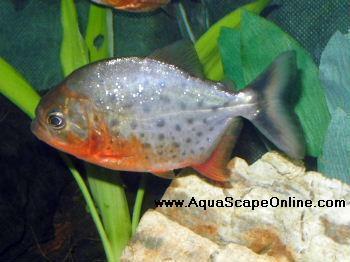 Compared to the other Pygocentrus-species, the Red Belly Piranha has a relatively nervous and shy character. Even though it can adjust to the presence of humans nearby, many captive reds will remain skittish throughout their life. Keeping them in a shoal of at least 5 fish (the more, the better), dimming the lights and using blackwater extract to mimic the murky waters of their original habitat, providing adequate places for them to hide (rocks, bog wood, plants), raising the water temperature, adding a potent powerhead to the tank, and placing the tank in a high traffic area are all suggested as the solution to decrease skittishness of the Red Belly Piranha, but unfortunately there is no guarantee any of these measures will work. Page displayed in: 3.3179 seconds.